In the late 1990s, I worked as a consultant at a technology company based in the midwestern United States. At one point, our team was rolling out a new version of a help desk solution. They needed to send someone to Europe to train new users, and, as luck would have it, they picked me. When I landed in Milan, I discovered that the group I was supposed to train had gone out on strike. My contact, a mid-level manager for the branch in Italy, couldn’t hide his exasperation. He apologized many times that day, and I had to keep telling him it was all right. He felt so guilty about the whole thing that he took me on a tour of the city. There wasn’t much else to do; in countries that respect the rights of labor, you don’t cross picket lines. Something he said that day as we were driving around Milan has stuck in my head ever since. We had to take a detour at one point, because a construction zone had recently become an archaeological site. He said, essentially, “You can’t dig anywhere in the city without finding artifacts from the past.” In fact, he said they tried not to move any earth if at all possible, because they know it’s going to happen — and it’ll throw off the schedule by months. In this case, the builders had gambled. They needed more parking within a densely populated section, and so they started in. I often think about what he said when I start digging into the New Testament. No matter where you plant your shovel, you’re bound to find tons of material, layer after layer of articles, lectures, theses, commentaries, and books. The density of material is probably greater in the gospels than elsewhere, and though I have no hard data to back it up, I strongly suspect the volume of information in the passion narratives is greater still. Any time I start to imagine that a superficial reading of a verse or a pericope will suffice, I have to remind myself that my opinion will surely change once I start digging. It will never be as simple as I expected, and my first impressions are often completely wrong. Consider, for example, the supposed slam-dunk argument from Q (Q for Qwelle) skeptics that the minor agreements in Matthew and Luke represent intractable issues that advocates of the Two Source Theory cannot answer. They point to synoptic stories of Jesus’ mistreatment before being sent to Pilate a the prime example. On other occasions, Goodacre has emphasized the fact that these are five consecutive words (τίς ἐστιν ὁ παίσας σε) found in both Luke and Matthew but not in Mark. Moreover, they appear in the passion narrative, which the great majority of scholars believe Q did not have. Initially, on the surface at least, this argument seems quite sound. But what happens when we start digging? Don’t embarrass yourself in public. 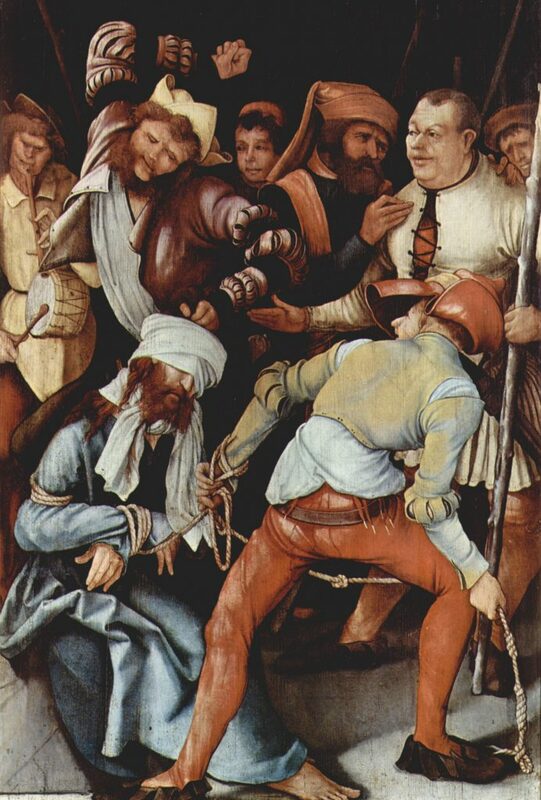 A group of soldiers arrests Jesus. The arresting squad takes him to the high priest for the Sanhedrin trial. At the end of the trial, the high priest charges Jesus with blasphemy. The people holding Jesus abuse him . . .
by beating and blindfolding him. They mockingly ask him to prophesy . . .
and tell them who is striking him (because he can’t see). Arrest –> Trial –> Blasphemy –> Abuse –> Blindfold –> Prophesy! –> Who? Matthew’s gospel follows Mark, but it omits the covering of the face. On the other hand, it also adds the taunting question. Arrest –> Trial –> Blasphemy –> Abuse –> ____ –> Prophesy! –> Who? With Matthew, then, we have an oddity. They haven’t blindfolded Jesus, but they’re asking him to guess who hit him. This schematic sequence requires some explanation. The trial occurs at the end of the series of events. In fact, according to Luke, nothing happens at the end of the Sanhedrin trial other than sending Jesus off to see Pilate. Strangely enough, in the third gospel, the high priest does not explicitly accuse Jesus of blasphemy. Instead, Luke uses the word to describe what they did to Jesus. This shifting and re-purposing of language in Luke is convincing evidence of Markan priority. In a curious twist, he salvages and re-uses some of Mark’s vocabulary to say something entirely different. On the other hand, Matthew keeps the verdict intact and doubles up on the accusation. We need to make this distinction, because in Luke’s conception, the ruffians are playing a cruel game with him. The men have blindfolded him, and they hit him again and again asking, “Who hit you?” This is how they passed the time, waiting to be called in to see the Sanhedrin: playing a game of Blind Man’s Buff. How do we explain Matthew? Matthew wishes to remind us of Isaiah 50:6, in which the obedient servant of God endures similar abuse. Now that we understand the context, the question — “Who is it that struck you?” — seems odd indeed. In fact, the sharp irony of “Prophesy, you Christ!” is blunted by the non sequitur question that follows. Luke, as we see in chapter 18, did not specifically think of spitting in the face as essential to the prophecy. Moreover, he expected it to happen after the Jews turned him over to Pilate. 31. And taking the twelve, he said to them, “See, we are going up to Jerusalem, and everything that is written about the Son of Man by the prophets will be accomplished. 32. For he will be delivered over to the Gentiles and will be mocked and shamefully treated and spit upon. The cohort holding Jesus before the trial in Luke were the hired muscle working for “the chief priests and officers of the temple and elders who had come against Him” (22:52, NASB), not Gentiles. Only in Luke’s gospel do we get the unmistakably clear picture of the captors taunting Jesus in a mocking game — which, along with the substantially different order of events, has led some scholars to infer that the third evangelist was following a secondary source. In fact, B.H. Streeter believed that both the veiling of the face and the taunting question (tis estin . . .?) were originally present only in Luke. Streeter continues by arguing that the passage in Matthew represents one of the extremely rare cases in which the text of one gospel has influenced another, with no extant copies left to prove it. In other words, we know that a great deal of variation exists among all manuscripts. It would seem likely that in at least some rare cases, every copy we have of a gospel is “wrong” at some point, and that the original reading is lost forever. Streeter reminds us that the NT manuscripts abound with variations. Neirynck cites three bits of evidence that support the notion that the question originated with Luke. We’ve discussed the first, but what about the other two? By “the use of ἐπερωτάω [eperōtaō],” he’s referring to the fact that unlike Matthew, the third evangelist doesn’t just use the verb to say. By “the construction τίσ ἐστιν ὁ + participle,” he is referring to the fact that Luke is using a participle as a noun. Imagine for a moment that in English you could say “the having-struck you” as an alternate way of saying “the person who struck you.” As I understand his argument, Neirynck thinks this construction, while not unknown in Matthew (see, for example, Matt. 5:28), is far more congenial to Luke. This particular minor agreement is not the slam-dunk argument that some anti-Q people would lead you to believe. For anyone reading this post who might be interested in learning more about the arguments and counterarguments surrounding this minor agreement, I highly recommend Neirynck’s paper, which you can find in Evangelica II: 1982-1991: Collected Essays. I’ve barely scratched the surface here. Neirynck’s treatment covers several different theories that try to explain it, from a now-lost version of Mark that contained the question to oral traditions that Matthew and Luke supposedly drew upon. It’s a massive undertaking, containing 234 footnotes and hundreds of citations of other works. As I said at the beginning, no matter where you plant your shovel in the gospels, you’ll find a seemingly limitless supply of works dealing with all aspects of the subject. It’s often overwhelming. But to get the real point of this post, I wanted to show that the answer is not cut and dried. In fact, when it comes to NT studies, it seems no consensus is ever definitively put to rest. What was certain in 1950 may be considered wholly discredited three decades later, only to be resurrected in the 21st century. As I’ve said before, I have no ax to grind here. In general, I think the Two Source Theory makes sense. On the other hand, I’m open to idea that Luke used Matthew. What I want to make clear is that this particular minor agreement — which, by the way, is the only one Streeter couldn’t explain using ordinary redactional methods — is not the slam-dunk argument that some anti-Q people would lead you to believe. Anyone who tells you otherwise is either unaware of the underlying complexity or they’re glossing over it to make their argument seem stronger than it really is. Posted on 2016-08-06 22:37:36 GMT+0000 by Tim Widowfield. This entry was posted in Biblical Studies and tagged Burnett Hillman Streeter, Mark Goodacre, Source Criticism, Synoptic Gospels, Textual Criticism. Bookmark the permalink. ‘The First Mistreatment (Matt 26:67-68). ‘These verses have four notable differences when compared with Mark 14:65. First, the address “Christ” is inserted, creating a parallel to the mistreatment by the Gentile soldiers who still greet Jesus as “King of the Jews” (27:29). Second, Jesus’ face is no longer covered. Third, the Markan conclusion “and the attendants received him with slaps ” is omitted because Matthew has already mentioned the slapping in v. 67b. ‘However, the most noteworthy difference is the fourth, the question inserted as a conclusion: “who is hitting you?” It appears in Luke 22:64 also and is one of the strangest of the minor agreements with Matthew. Unfortunately, there is no convincing explanation for it. Text-critical explanations such as that this question was already in the Markan text [note: It is added to Mark 14:65 by among others ***, and text-critically is a typical secondary adaptation to the Synoptic parallels. ], or that it is an interpolation in Matthew as harmonization with Luke [note: A popular explanation since Streeter. It is a conjecture pure and simple, since there is not a single witness in which the question is missing. The main argument for this explanation is that Matthew could not have omitted the covering of the head and at the same time added the question “who has hit you?” My interpretation will show that this is conceivable.] are, in my judgment to be eliminated. The Griesbach hypothesis is also out of the question as an explanation, for it would be not at all understandable why Mark should omit the question “who is hitting you?” that appears in both Matthew and Luke, especially when he had taken over from Luke the covering of Jesus’ face that accompanied the question. The suggestion that Luke used Matthew would explain the Lukan text by not the Matthean. Matthew probably omitted the covering of Jesus’ face so that one could actually spit in his face, but the question “who is hitting you?” most naturally presupposes that his face is covered [note: Goulder argues that Luke used Matthew, then assumes that in writing down the question Matthew did not notice that he had just written of the spitting in Jesus’ uncovered face. Here too much carelessness is attributed to Matthew]. In the case of such a long addition, independent redaction on the part of Matthew and Luke is almost out of the question. It is conceivable, however, that a question “who hit you?” from the well-known “blind man’s bluff” games was taken by Matthew and Luke from a deutero-Markan recenssion or from an oral tradition and that Matthew then reinterpreted it. If Luz is correct above, then GMatthew wished to ensure that Jesus literally had his uncovered face spat upon, to connect Jesus with Scripture like in Isa. Three of our oldest witnesses, Origen and P70 from the third century, and Eusebius from the fourth, read Nacapa at Mat. 2:23, and this should be accepted as the original, as at 4:13. Matthew is probably inferring the form from his (amended) citation of Jg. 13:5,7, NacopaxioqS orti, on analogy with ‘Iou)aioS, ‘Iou&ai. So Naxapa is Matthaean, and Luke’s use of the Matthaean form at Lk. 4:16 is an indication that he knows Matthew’s Gospel. At 26:67-68 Matthew has divided the mockers into two groups. The first spit in Jesus’ face, and punch it, and the evangelist therefore suppresses Mark’s blindfolding, which would protect Jesus. The second group belabour Jesus with sticks from around and behind; as he cannot see them, the “Prophesy!” taunt is transferred to them, with its explanatory, “Who is it who smote you?” Luke has the same addition of five words in the same order, including a hapax. It is difficult to resist the conclusion here that Luke knew Matthew’s Gospel. Also, have you heard of the “Undesigned coincidences” argument of J. J. Blunt from the mid-nineteenth century, and recently revived by Christian apologists, Tim and Lydia McGrew? They cite the way the Gospel stories explain puzzling aspects of each other’s stories as if such stories were based on eyewitness reporting, at least that is the apologist’s interpretation, i.e., Luke (and Mark) explain why Jesus was being asked, “Who hit you?” in Matthew where Jesus is not said to have been blindfolded. It is because the Gospels are based on historically authentic stories that explain one another’s omissions and hence fit together like a hand fits a glove. To the apologist there is no synoptic problem only genuine history in the Gospels. McGrew also finds Ehrman’s arguments for contradictions in the Gospels so weak that he claims Ehrman’s arguments almost made McGrew an inerrantist, the exact opposite of what Ehrman wants people to become. I tried on vain to get Tim to view such questions in terms of Markan priority and the synoptic problem, but now I hear Lydia is coming out with a book advocating that the Gospels were based primarily on eyewitness testimony and that they fit together like a glove. Their most intricate argument in favor of historical authenticity via the undesigned coincidences approach involves their analysis of the feeding stories found in all four Gospels. I have seen videos by apologists now using such an argument, and have much to day in response, but I await the publication of Lydia’s book. When you start from the postulate that the gospels arose out of accurate eyewitness accounts, you end up with arguments of Byzantine complexity. I’m never quite certain if these people are serious or if it’s just some sort of mental game they’re playing. In Mark, Jesus is being slapped around and ordered to “Prophesy!” It is the middle of a sandwich where his prophecy that Peter would betray him is being fulfilled. The Gospel of John maintains the sandwich but omits the order to prophesy and loses the irony. I think that the author of Luke was at least partially independent from Mark and Matthew. There is another other major difference between Luke and the other two Synoptics in the trial section that is not mentioned or discussed in the article above. The content of Luke 22:66-71 is similar to the content of Mark 14:53–64 and Matthew 26:57–66. However, there is a major difference. Luke states that the trial began at daybreak, whereas the other two do not. This creates a potential problem. However, in 2011, Colin Humphreys published a book that featured a detailed analysis of the sequence of events from the Last Supper to the crucifixion. In this book, he argues that the Last Supper took place on Wednesday evening and that the crucifixion occurred on Friday. The time notice in Luke 22:66 is a key piece of his reconstruction. He argues that there were actually two separate trials before the Sanhedrin – one starting on Thursday morning at daybreak and a second one starting very early in the morning on Friday. Some scholars may object to my analysis, arguing that there was only one Sanhedrin trial and not two. Such scholars would argue that Luke 22:66–71, my first Sanhedrin trial at daybreak, is in parallel with Matthew 27:1 and Mark 15:1, my second trial at daybreak, and that all three gospels are reporting one and the same trial. I disagree for the following reasons. Luke 22:67 reports the Sanhedrin asking Jesus if he was the Christ, which is in parallel with Matthew 26:63 and Mark 14:61. Luke 22:68 then reports Jesus replying that he will be seated at the right hand of God, in parallel with Matthew 26:64 and Mark 14:62. Luke 22:71 further reports the Sanhedrin asking ‘Why do we need any more testimony?’ This is in parallel with Matthew 26:65 and Mark 14:63. Hence Luke 22:66–71 is in parallel with Matthew 26:57–66 and Mark 14:53–64, and not with Matthew 27:1 and Mark 15:1. Matthew 26:57–66 and the parallel Mark 14:53–64 describe a trial by the Sanhedrin which comes to a clear end. Mark 14:64 states: ‘They all condemned him as worthy of death’, and Matthew 26:66 repeats this. The trial has finished and the death sentence has been passed. Immediately following sentencing, Jesus is handed over to the guards, who beat him (Mark 14:65). Matthew and Mark then separate this trial from a second Sanhedrin trial by placing the denials by Peter between the two trials (Matthew 26:69–75; Mark 14:66–72). Although I have argued that these denials by Peter are not narrated in their strict chronological position by Matthew and Mark, nevertheless in Matthew and Mark they serve to separate the two trials by the Sanhedrin, and Matthew and Mark use them in this way. Mark 15:1 and Matthew 27:1 then describe how the Sanhedrin met very early in the morning and reached a decision. R. T. France states that they met ‘to ratify formally the result of the night’s proceedings’ (France, The Gospel of Mark, p. 627). However, according to Luke, the first trial had started at daybreak and was not at night (Luke 22:66). Mark and Matthew are describing here, in only one sentence, a short Sanhedrin trial, at daybreak, confirming the decision of the main Sanhedrin trial, which also started at daybreak. Since both trials started at daybreak, the two trials were necessarily on successive days. I think that Humphreys’ reconstruction makes sense of the evidence and provides additional reasons to think that the author of Luke was partially independent from Mark and Matthew. Of course multiplying events (in this case multiplying trials) is a typical technique employed by inerrantists and other conservative interpreters of biblical authority. Like the technique of multiplying denials of Peter. But disagreements between some of the denials were so blatant in some cases that one conservative Christian insisted Peter must have denied Jesus as many times as there are unharmonizable incidents in all four Gospels. That Christian had convinced himself that Peter may have denied Jesus more than three times, maybe six or more times, so long as he could find a way to retain the possibility of the historical authenticity of details in his Bible and read the Gospels like a single story—instead of four separate stories, including some that changed over time. He continued to argue that his solution of multiplying the total number of denials was the most reasonable, regardless of the fact that each Gospel by itself agrees with the others that Jesus only mentioned three denials by Peter. Edward – I don’t think that the harmonization attempts related to Peter’s denials or the anointing are necessarily relevant to the discussion about Humphreys’ approach to the Last Supper. I think that the various harmonization attempts need to be refuted or accepted on a case-by-case basis. Humphreys’ case for the Last Supper occurring on Wednesday evening and there having been two separate Sanhedrin trials on two separate days is a cumulative case that is based on several lines of evidence. I don’t think that it can be dismissed so easily. I think that you would need to engage with the details in order to refute it. That’s not to say that I agree with everything that he says. I disagree with nearly everything in one chapter of his book and there are a few details in other places that I disagree with as well, but I still think that his overall case is still very strong. I would encourage you to take a closer look and see what you think of it. Humprhy is not a biblical scholar, but displays a typical conservative Christian mindset. No they can’t. Humphrey considers the fourth Gospel as more historical than the synoptics, and is willing to turn the synoptics around any which way he can, using any hypothesis from any dubious source he can, in order to try and make Jesus die “as the lambs were being slain,” which was probably a theological tall tale introduced late by the author of the fourth Gospel, not something Jesus “set up” at all (the fourth Gospel also has John the Baptist call Jesus the “Lamb of God” upon first meeting Jesus). The “Lamb of God” idea is unique to that late Gospel. Even Humphrey’s fellow conservative Evangelical Christians find the fourth Gospel the most questionable when it comes to its so-called sayings and doings of Jesus. See this evidence: https://edward-t-babinski.blogspot.com/search/label/Gospel%20of%20John The fourth Gospel is not of equal merit with earlier Gospels. And its tale of Jesus being the Lamb of God is late. Humphrey’s work is typical harmonistic claptrap. What is your basis for saying that Humphreys “turn[s] the synoptics around any which way he can, using any hypothesis from any dubious source he can” in order to align them with John? Do you have any specific evidence from any of the primary sources that would cast doubt on any of the specific aspects of Humphreys’ interpretation of the Synoptics? Telford certainly doesn’t make a claim like this. Before he gets around to criticizing the book, he admits that Humphreys’ book is, “precise and lucid, well organized in terms of its presentation, and cogent in its argumentation”. If he thought that Humphreys was twisting and turning the Synoptics any which way and using any hypothesis from any dubious source that he could, then I think he would almost certainly have been even more critical of Humphreys’ approach. Also, where did you get the supposed quotation from? The reason I ask this question is that the words within the quotation marks do not constitute an actual straight quotation from Humphreys’ book. Did you get this quotation from a secondary source? Granted, some of the specific words that appear in the supposed quotation do actually appear in the book, but it is not a quotation and should not be represented as one. It is obvious Humohrey is assuming the fourth Gospel’s tale about Jesus being the Lamb of God who dies on the same day as the lambs is true, and gives it primacy. Everything else in Humphrey’s book seems bent round that pinion, and round the standard conservative Christian pinion of harmonization, and look at his other works as well. Humphrey is a standard apologist in all respects, both OT and NT. And please read my pieces comparing the fourth Gospel with the Synoptics to understand how idiotic Christian apologetic harmonization “scholarship” is. Colin Humphreys … argues that there were actually two separate trials before the Sanhedrin – one starting on Thursday morning at daybreak and a second one starting very early in the morning on Friday. Luke offers not two, but five trials/interrogations: Sanhedrin night; Sanhedrin daybreak; Pilate 1; Herod; Pilate 2. All jammed in between around midnight and midday. There simply isn’t enough time on Nisan 15 beginning at sunset for: a lengthy passover meal; Jesus and co. traipsing to the Mount of Olives; Jesus praying in the garden; Jesus’ arrest; hauling Jesus to the high priest’s house; rousing all 70 Sanhedrin members from their beds & collecting them at high priest’s house; dragging in witnesses; holding the trial; finally shipping Jesus off to Pilate (or the Pilate-Herod hot-potato game). It didn’t happen. While an account of some historical trial (James’ perhaps?) may have provided inspiration for Mark, there’s no need to postulate Luke working independently off a third source of Jesus’ trial. (Even had some such source existed, it would have been just as much an impossible fantasy as the timeline in Mark.) Rather, what we see is the standard Lukan attempt to both tidy up yet also embellish Mark. Matt – I agree that it almost certainly is not possible to fit all of the events that are narrated in the gospels between midnight and the middle of the next day. I am arguing that these events took place between Wednesday evening and Friday morning. If that’s the case, then there would have been plenty of time to fit in all of the events that are narrated in the gospels. It isn’t possible to go into all of the details here and explain how Humphreys came to the conclusion that the Last Supper took place on the Wednesday evening (rather than the Thursday evening) before the crucifixion. It took him about 226 pages with End Notes to do so. I would encourage you to take a look at the book and see what you think of it. If you want the Crucifixion to occur on what we call ‘Friday’, then the Last Supper — irrefutably a Passover meal — must occur on our ‘Thursday’. Mark 14:12-17, Luke 22:7-16, & Matt: 26:17-20 explicitly state that the disciples prepared for the feast during the day, then after sunset they and Jesus sat for the Passover meal. Jewish custom is to prepare the Pesach meal during the day (Nisan 14), then slaughter the lamb just after sunset (beginning of Nisan 15 / Pesach I) and hold the meal shortly thereafter. So everything from the Last Supper to laying Jesus in the tomb had to occur between sunset and sunrise on Nisan 15. Humphreys apparently argues that Jesus & co. celebrated Pesach a day earlier, on Nisan 14. Now, I’ve reviewed arguments that Jesus was an Essene (putative), and the Essenes kept a different calendar (true), and remain unimpressed. This all seems a fairly desperate ad hoc solution just to add an extra 24 hours to stage an already implausible sequence of events. The cost of which is to reject as false one of the most ‘synoptic’ pericopes in the synoptics! This ad hoc shifting of dates also undermines the argument that Luke & Mark worked independently off some chimerical ‘Passion-Quelle’, as that source would also have mistakenly jammed a multi-day process into 24 hours. Meaning that author was quite distanced from the alleged actual events, thus necessitating the existence of an Ur-Quelle behind the Quelle! non sunt multiplicanda entia sine necessitate — most parsimonious answer: Mark made it up; Luke & Matthew copied. Correction: between sunset and sunset on Nisan 15. Matt – Thank you for your reply. It’s obvious that you’ve researched this issue and given it a lot of thought. I’ve changed my mind. I am going to go ahead and give a very high-level overview of the details of Humphreys’ reconstruction. In the process, I’m going to cover some things that you seem to be aware of already. You wrote, “Now, I’ve reviewed arguments that Jesus was an Essene (putative), and the Essenes kept a different calendar (true), and remain unimpressed.” I think you’re referring to the Essene Calendar theory that was first propounded by Annie Jaubert and Eugen Ruckstuhl in the late 50s and early 60s. According to this theory, the Last Supper was celebrated according to the Essene Calendar on Tuesday evening and the crucifixion took place on Friday. I’m also convinced that this theory is fatally flawed. I won’t list the issues with it though unless asked to do so. In the official Jewish calendar, the day runs from sunset to sunset, the preparations for the Passover meal occur toward the end of day on Nisan 14, and the Passover meal is eaten in the evening at the beginning of Nisan 15. When we study this verse carefully, it quickly becomes apparent that there may be a problem. In the official calendar, the preparations occur on Nisan 14 and the first day of the unleavened bread is Nisan 15. As a result, the verse above is analogous to saying, “On December 26th, when it was customary to prepare Christmas dinner …” There are several ways to interpret this verse. Humphreys takes this verse as evidence that the author of Mark has a different calendar in mind – a calendar in which the day is reckoned from sunrise to sunrise, rather than from sunset to sunset. He analyzes several calendars with sunrise to sunrise days and concludes that Jesus was celebrating the Passover using a calendar that was similar to the calendar that is still used in modern times by the Samaritans living in the West Bank. He argues that this calendar is the calendar that was used by the Jews before the Babylonian exile. So, in essence, he is arguing that Jesus was using the “pre-exilic” Jewish calendar to celebrate the Passover. As an aside, I think that it’s interesting that, in John 8:48, a group of Pharisees supposedly thought that Jesus was a Samaritan. This verse is not mentioned in Humphreys’ book. Humphreys calculates the dates for Passover in the two different calendars in AD 30 and AD 33 and concludes that, in AD 33, in the pre-exilic calendar, Nisan 14 would have started in the morning on Wednesday, April 1 and would have ended the next morning at sunrise. He concludes that, in AD 33, in the official Jewish calendar, Nisan 14 would have started in the evening on Thursday, April 2 and would have ended in the evening on Friday, April 3 at sunset. Nisan 15 would have run from Friday evening to Saturday evening in the official calendar. Putting the Last Supper on Wednesday evening solves several problems. For one thing, it makes it possible to fit in all of the events that are narrated as having occurred between the Last Supper and the crucifixion. After a lot of research, I have concluded that this reconstruction is not subject to the same fatal flaws that the Essene calendar theory is subject to. There is a lot more to say about this theory, but this comment is already quite long. I’ll stop here. Paul, thanks for elaborating on Humphreys’ hypothesis. You’ve highlighted the pitfall of confusion when attempting to synchronize the Jewish week with the Gentile. How Mark 14 describes the events of that day is not troublesome, any more than me telling you ‘I had a dream last night’, when technically it was earlier today. Just because Jews divided calendar days at sunset, doesn’t mean they didn’t also experience morning, day, evening, and night. What comes through in Mark 14, IMO, is the voice of someone who, although familiar with Jewish practices, was themselves not following the Jewish religious calendar. Yet another element divorcing Mark from the putative oral tradition of the first jewish-christian followers of Jesus. Attempting to date to a particular year the disparity between Samaritan or Essene vs. orthodox calendars is a wild goose chase. The new year was calculated by observing the first sprouting of grain. The beginning of months by observing the first sliver of the moon. If clouds obscured the night sky, feast days were celebrated twice in a row just to be sure. Compound these fudge factors two thousand times and your chances of not being wildly off the mark are exceedingly slim. Again, sorry, but all this strikes me as a desperate attempt to salvage a bit of historicity out of what remains a wholly implausible scenario. Matt – This is a response to the four questions in your most recent comment that is located at http://www.vridar.org/2016/08/06/who-is-it-that-struck-you-minor-agreements-and-major-headaches/#comment-79031. We have evidence from the Old and New Testaments, the Dead Sea Scrolls, and the writings of Josephus that seem to indicate that there were Jewish sects in the first century that used calendars in which the day was reckoned from sunrise-to-sunrise. Let me know if you want me to go into more detail. I would say that Mark 14:12, Mark 16:2, and Matthew 28:1 all provide circumstantial evidence that Jesus was associated with a tradition that reckoned the day from sunrise-to-sunrise. See my response to Tim, which is located at http://www.vridar.org/2016/08/06/who-is-it-that-struck-you-minor-agreements-and-major-headaches/#comment-79024, for more details. There are several additional problems (besides the need for more time) that Humphreys’ reconstruction solves. Humphreys lists four problems in Chapter 1 of his book. His reconstruction provides interesting answers / solutions to each of the problems. The time crunch issue that we have been discussing happens to be issue #3. Issue #2 is the question of whether the Last Supper was an authentic Passover meal or not. Humphreys argues that it was an authentic Passover meal in the alternative calendar. Issue #4 has to do with the legality of the trial of Jesus before the Sanhedrin. According to the Mishnah, in capital cases, the Sanhedrin was required to deliberate for at least two days. Humphreys thinks that they followed this guideline by holding the main trial on Thursday during the daylight hours and then meeting again on Friday morning to confirm their decision. I think the evidence indicates that the “sunrise-centric” groups were maintaining a calendrical tradition that was older than the official Jewish calendar tradition and that it was important to them to maintain this older tradition. I think it’s very likely that the properties of the official Jewish calendar were established during the Babylonian exile, which started in 587 BCE. I think it’s very likely that the Samaritan calendar and related lunisolar calendars with a “sunrise-centric” focus were based on traditions that went back several hundred years earlier. I think that Tim has misinterpreted the evidence. Mark 16:2 is consistent with a “sunrise-centric” reckoning. Mark 16:2 says, “Very early on the first day of the week, just after sunrise …” This wording seems to indicate that the first day of the week started at sunrise. I don’t think that Mark reflects a sunset-to-sunset reckoning at all, except for possibly in Mark 15:42-43. But, it makes sense that these verses would reflect the sunset reckoning because Joseph of Arimathea was a member of the Sanhedrin (Mark 15:43) and would most likely have been following the official calendar. That doesn’t square with Mark 15:42-46, in which evening is approaching, and along with it, the Sabbath. And so Joseph of Arimathea begs Pilate for the body so he can bury Jesus quickly. Similarly the women visiting the tomb buy spices after the Sabbath is over. And that happens before sunrise on the first day of the week. Hence, the Sabbath had ended the evening before; they went out to buy spices; and then in the morning they hiked over to the grave site. I would like to start by elaborating a little bit more on the content of Humphreys’ theory about the chronology of the Last Supper, trials, and crucifixion of Jesus. According to his theory, Jesus and many of his close followers were using an alternate calendar in which the day was reckoned from sunrise to sunrise and the use of this alternate calendar is reflected in many cases in all three of the Synoptic gospels. According to Humphreys’ theory, the chronology in John reflects the use of the official Jewish calendar in which the day was reckoned from sunset to sunset. If Humphreys’ theory is correct, then Jesus and his close followers would have reckoned the Sabbath as running from sunrise on Saturday to sunrise on Sunday and they would have reckoned the first day of the week as running from sunrise on Sunday to sunrise on Monday. Let’s take a look at Mark 16:1-3 first. This passage seems to be parallel to Matthew 28:1. Both passages mention Mary Magdalene and another Mary. There has been a long-running discussion of Matthew 28:1 that has been going on for hundreds of years. The apparent problem with this passage is that it seems to indicate that Mary Magdalene and the other Mary had reckoned the Sabbath as running from sunrise on Saturday to sunrise on Sunday. I disagree with the last part of Winger’s analysis. I would contend that this verse is not the only piece of evidence that the close followers of Jesus were using an alternate calendar in which the day began at sunrise. The foregoing evidence for the sunrise reckoning provides a plausible explanation for the apparent contradiction present in the time references of Matthew 28:1. If Matthew, like Josephus, sometimes used the sunrise to sunrise reckoning, then his statement that the two Marys came to see the sepulchre “in the end of the sabbath, as it began to dawn toward the first day of the week” (Matt 28:1), makes perfect sense, because the end of the Sabbath would indeed mark the dawning of the first day of the week. I am basically in agreement with Bacchiocchi. I think that a careful reading of Mark 16:2 shows that the author of Mark is also reckoning the Sabbath as ending at sunrise on Sunday. Mark 16:2 says, “Very early on the first day of the week, just after sunrise …” So according to the author of Mark, the two Marys reckoned that the first day of the week as starting at sunrise on Sunday. So, I think that Matthew 28:1 and Mark 16:2 both count as striking confirmations of Humphreys’ theory. The interesting thing is that he never mentions this in his book. Mark 15:42-43 is a different story. I agree that in these verses, the Sabbath is being reckoned as running from Friday evening at sunset to Saturday evening at sunset. However, Joseph of Arimathea was a member of the Sanhedrin and as such, I think he would have been using the official calendar for his own reckoning of the Sabbath. I think this would have been obvious to the original readers of the gospel of Mark. As a result, I don’t think there was any need to explain that he was using the official calendar and that the close followers of Jesus were not. On the whole, I think that these two passages from Mark continue to support Humphreys’ theory about the chronology of events during the Last Supper, trials, and crucifixion of Jesus. •	“Matthew 28:1 Re-examined,” New Testament Studies 27 (1981), 277-282. •	Driver, G R , ‘Two Problems in the New Testament’, JTS 16 (1965), pp 327-31. •	Abbot-Smith, G. 1937. Manual Greek lexicon of the New Testament. London: T. & T. Clark. •	Bauer, Waiter et al. 1957. A Greek-English lexicon of the New Testament and other early Christian literature. Chicago: University of Chicago Press. •	Boyarin, Daniel. 2001. ‘After the Sabbath’ (Matt. 28.1) – Once more into the crux. Journal of Theological Studies, n.s., 52, pt. 2 (October): 678-688. •	Driver, G.R. 1965. Two problems in the New Testament. Journal of Theological Studies, n.s., 16, pt. 2 (October): 327-331. •	Gardiner-Smith, P. 1926. EnIQ~KEIN. Journal of Theological Studies 27: 179-181. •	Grintz, I.M. 1960. Hebrew as the spoken and written language in the last days of the second temple. Journal of Biblical Literature 79:37-39. Quoted in Winger 1994, 286. 1) What evidence is there of this alternate reckoning being used by any Jewish sect back then? 2) What connects Jesus to this use, other than the need to provide more time for the Passion? 3) Why were these sunrise-centric Jesus followers — Mary, Joseph, the disciples observing the Passover feast — so concerned about sunset? 4) If the ultimate source of Mark’s information was accounts from that sunrise-demarcation cult, then why did Mark describe the events of those days from a sunset-demarcation perspective (as Tim notes)? Although Goodacre and others are correct to point out that the Two Source hypothesis is unsustainable, they go in the wrong direction and try to give a simpler, “Occam’s Razor” approach that is equally unsustainable because there is simply no way that both Matthew and Luke would produce such complicated revisions, jumping back and forth with their copying for no discernible reason. Rather, we need to accept that 250 years is a long enough time for multiple revisions by many different people. Of course the more revisions and the more complicated it is, the less likely we in the future will be able to successfully reconstruct the exact evolution of the gospels, but that uncomfortable reality is not argument against it happening. Nevertheless, Delbert Burkett has constructed a a Multi-Source hypothesis that explains both the minor agreements between Matthew and Luke as coming from Matthew and Luke using earlier versions of proto-Mark. Not only that, he shows that if you pull out the narrative elements from Matthew’s Mark and Luke’s Mark, it results multiple narrative flows that fix the chronological problems, similar to how the Documentary Hypothesis showed there were two complete versions of the Noah’s Ark story in Genesis. Thanks for the reference. I look forward to having a closer look at this book. As for quite different ways different authors (Plutarch, Tacitus and Suetonius) can draw upon a common source text, Gwyn Morgan has an interesting discussion in his book 69 A.D.: The Year of Four Emperors, pp. 287-89. I’ve ordered it as well. It should be here in a few days. The Ur-Marcas concept used to be quite common in solutions to the synoptic problem, but slowly lost favor over the middle of the previous century. I’ve always wondered whether changes like this have more to do with the shift from German scholarship to (extremely conservative) Anglo-American scholarship than with any serious re-examination of the data. This book looks extremely interesting. I just ordered a copy. Very interesting. Thanks for this excellent post. We have evidence from the Old and New Testaments, the Dead Sea Scrolls, and the writings of Josephus that seem to indicate that there were Jewish sects in the first century that used calendars in which the day was reckoned from sunrise-to-sunrise. Let me know if you want me to go into more detail. Just citing the locations in those sources will do fine. I would say that Mark 14:12, Mark 16:2, and Matthew 28:1 all provide circumstantial evidence that Jesus was associated with a tradition that reckoned the day from sunrise-to-sunrise. I don’t think that Mark reflects a sunset-to-sunset reckoning at all, except for possibly in Mark 15:42-43. That’s indication that Mark was familiar with Pesach & Shabbat traditions, but himself & his readership followed a gentile week. Mark 16:2 says, “Very early on the first day of the week, just after sunrise …” This wording seems to indicate that the first day of the week started at sunrise. For Mark and his audience, yes. It in no way implies the characters in the story marked days that way. According to the Mishnah, in capital cases, the Sanhedrin was required to deliberate for at least two days. IIRC, the Sanhedrin was only allowed to give a verdict during daylight. In any case, it’s preposterous to think that on the eve of Passover, the high priest had time to take from his duties to assemble the Sanhedrin and spend even one day trying yet another rabble rouser. Or that Pilate, preoccupied with responding to a potential riot, would stop to interview yet another partisan in local sectarian religious squabbles. If not summarily executed, Jesus would’ve been tossed in a prison cell for a week or more, and dealt with when time permitted. I recommend reading pages 8 – 13 in “Shadow on the Steps: Time Measurement in Ancient Israel”, which can be downloaded from http://escholarship.org/uc/item/8q86391z. This book is actually a PhD dissertation from a student at the University of California at San Diego. A careful study of the Old Testament shows that it seems to be curiously conflicted regarding whether the day should be reckoned from sunrise-to-sunrise or sunset-to-sunset. One of the best examples of this can be seen in the contrasting Passover legislation in Exodus 12 and Leviticus 23. 3 Tell the whole community of Israel that on the tenth day of this month each man is to take a lamb for his family, one for each household. … 6 Take care of them until the fourteenth day of the month, when all the members of the community of Israel must slaughter them at twilight. … 8 That same night they are to eat the meat roasted over the fire, along with bitter herbs, and bread made without yeast. … 10 Do not leave any of it till morning; if some is left till morning, you must burn it. 11 This is how you are to eat it: with your cloak tucked into your belt, your sandals on your feet and your staff in your hand. Eat it in haste; it is the LORD’s Passover. … 14 “This is a day you are to commemorate; for the generations to come you shall celebrate it as a festival to the LORD—a lasting ordinance. 15 For seven days you are to eat bread made without yeast. On the first day remove the yeast from your houses, for whoever eats anything with yeast in it from the first day through the seventh must be cut off from Israel. 16 On the first day hold a sacred assembly, and another one on the seventh day. Do no work at all on these days, except to prepare food for everyone to eat; that is all you may do. 17 “Celebrate the Festival of Unleavened Bread, because it was on this very day that I brought your divisions out of Egypt. Celebrate this day as a lasting ordinance for the generations to come. 18 In the first month you are to eat bread made without yeast, from the evening of the fourteenth day until the evening of the twenty-first day. The interesting thing is that Exodus 12 never mentions Nisan 15. The way it is written seems to imply that the night on which the Passover is eaten is still counted as Nisan 14. If this is the case, then it seems that Exodus 12 is based on a sunrise-to-sunrise reckoning of the day. This passage clearly reflects a sunset-to-sunset reckoning of the day. In contrast to Exodus 12, this passage clearly mentions Nisan 15. There have been various theories forwarded to explain this apparent contradiction within the Old Testament. I favor the theory that the earliest Jewish calendar had a sunrise-to-sunrise day and then adjustments were made during and after the exile in Babylon starting in 587 BCE, which led to a proliferation of different calendars in Second Temple Judaism. I think that Exodus 12 reflects pre-exilic calendrical methods and that Leviticus 23 reflects post-exilic calendrical methods. These differences can also be seen in the writings of Josephus. It is well-known that Dead Sea Scrolls contain information about calendars that were significantly different than the official Jewish calendar. For an introduction to this topic, see https://en.wikipedia.org/wiki/Qumran_calendrical_texts. If the Synoptics represent Jesus as following a calendar tradition in which the day was reckoned from sunrise-to-sunrise, then I think it’s likely that this reflects the usage of different calendars among different groups of Jews, rather than a difference between Jewish and Gentile calendars. The way [Exodus 12] is written seems to imply that the night on which the Passover is eaten is still counted as Nisan 14. Take care of them until the fourteenth day of the month, when all the members of the community of Israel must slaughter them at twilight. …That same night …. Twilight/sunset here marks both the change in calendar days, and the change from day to night. Preparations take place thatday, then the feast is celebrated that night — which also happens to be the next calendar day. Parsing the second scripture, would you conclude that your tambourine was shaken at night or during the day? In fact, it was shaken later that same night, though technically on the next calendar day. I read enough of David Miano’s dissertation to see he is making the same pedantic mistake of conflating the calendar day with the diurnal. As we have the same disjunction today (albeit with midnight instead of sunset), the error is inexcusable. The point that I have been trying to make is that there seems to have been a curious lack of uniformity regarding when and how to celebrate Passover during the Second Temple period and that evidence of this diversity shows up both in the writings of Josephus, in the Dead Sea Scrolls, and in the Old Testament. I think I could have done a better job of presenting the evidence. I’ll try again. Here are some passages from the writings of Josephus and the OT that I think make this point more clearly. When the day of unleavened bread came round on the fourteenth of the month Xanthicus, the reputed anniversary of the Jews’ first liberation from Egypt, Eleazar and his men partly opened the gates and admitted citizens desiring to worship within the building [i.e. the Jerusalem temple]. Note: Xanthicus is the name of the month in the Macedonian calendar that is equivalent to Nisan in the Hebrew calendar. See https://en.wikipedia.org/wiki/Ancient_Macedonian_calendar. Thus it is that, in memory of the want we were then in, we keep a feast for eight days, which is called the Feast of Unleavened Bread. 21 In the first month on the fourteenth day you are to observe the Passover, a festival lasting seven days, during which you shall eat bread made without yeast. 5 The LORD’s Passover begins at twilight on the fourteenth day of the first month. 6 On the fifteenth day of that month the LORD’s Festival of Unleavened Bread begins; for seven days you must eat bread made without yeast. I submit that I think that the most important reason for these curious differences is that different groups of Jews in the Second Temple period were using different calendars. Quick: how many days on the weekend? Did you answer ‘two’ (Saturday & Sunday)? What about Friday? Most people would consider Friday night also part of the weekend. So ‘three’ is also a valid answer. Now, how many days of Passover? Our Josephus derives from his greek versions written for a gentile audience. His use of Greek months is entirely unremarkable. You earlier mentioned the alternate annual calendar used by the Qumran community; there’s no indication, however, it included a sunrise demarcation of days. I submit the primary reason for these ‘curious’ differences is that the OT authors were crappy writers. I think I could have done a better job of presenting the evidence. Actually, the more you expand on this hypothesis, the worse it looks. You engage in ‘gap’ logic, whereby a string of putative ‘just might haves’ are concatenated to become a definite ‘did’. Also, while I’ve responded point-by-point to your claims, you’ve just repeated those claims as if our previous discussion had never occurred. I think we’re done here. A valuable take from this valuable article is that the Struck Phrase is MORE original in GLuke than in GMatthew. Since it is unlikely that Luke quoted Matthew, this particular objection to the 2-source hypothesis looks vacated.